Facts might be the best way to substantiate an argument, but lies are the next best thing. Today's new-to-me word (well, term) is one that occasionally pops up and that I have to look up each time. So I thought I'd try to nail it down for myself, and possibly for you. 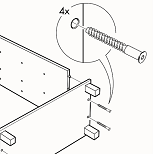 The term is the IKEA effect, which does indeed have something to do with the Swedish home-goods store. It does not describe the effect of overindulgence in their delicious meatballs, nor does it refer to a home that's kitted out with a bunch of furniture that's very nearly well designed. No, IKEA effect involves the way their furniture comes packaged—namely, in pieces—and the fact that you have to assemble it yourself. Even though this effort is pretty minimal, at least when compared to actually building furniture yourself, the small effort makes us more attached to the furniture than we would be if we just ordered it up from Amazon or something. We're probably all familiar with how we like something that we ourselves crafted—a ceramic mug, a painting, a knitted sweater, a loaf of bread—even if in absolute terms the thing might not have high market value. (Experiment: as you Kondoize your belongings, try to determine whether something you created yourself "sparks joy" more than something you bought whole or got as a gift.) The surprising aspect of the IKEA effect is, as noted, that it doesn't take much to go from pure consumer to "co-creator of value," as it says on the Wikipedia. The IKEA effect is a perhaps a subset of the idea of effort justification, which describes how we put value on something that exhibits labor; the more labor appears to go into something, the more we value it. Something that clearly seems to have taken extraordinary effort will accrue value by that measure alone. And speaking of extraordinary effort and value, let's turn our attention to ceilings. For this week's origins, I have a proper noun for a change. I'm sure you know about the Sistine Chapel, a chapel in Vatican City whose ceiling was painted by Michelangelo. Have you ever wondered why it’s called the Sistine Chapel? I hadn’t until recently. The answer is straightforward, if not necessarily obvious. In Italian, the word sistine is an adjectival form (“of or relating to”) the the pope name Sixtus. And sure enough, the Sistine Chapel was named for Pope Sixtus IV, who commissioned a restoration in the late 1400s. (A surprising detour here is that Sixtus does not mean “sixth”—that would be Sextus—but is an old Roman name.) A sort of fun fact is that it wasn’t Sixtus IV who hired Michelangelo to decorate the ceiling. That work was done several popes and about 30 years later under Julius II. Alas, not only did Julius II not get naming rights to the chapel's ceiling, he isn't responsible for the Julian calendar, either. Clearly he needed a better PR department.